Gov. Pat McCrory announced Thursday construction of the long-planned Mid-Currituck Bridge between the mainland and Corolla could be accelerated by two years due to transportation funding changes in the state budget approved in August. The most recent estimate had construction of the 7-mile long toll bridge over Currituck Sound starting in fiscal year 2019 and completion by 2025, at a cost of at least $410 million. The state would kick about $173 million in for initial planning, design work and right-of-way acquisition, and the rest would come from the sale of bonds that would be paid back using tolls. 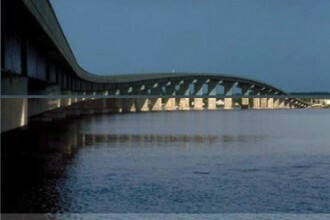 Just two weeks ago, the state Board of Transportation granted a request for $5.7 million from the state’s Highway Trust Fund, which is supported primarily by revenue generated by North Carolina’s motor fuels tax, to pay for purchase of a 7-acre tract in Corolla that will be the eastern landing of the bridge. The governor’s office said in a news release Thursday the budget reforms signed by McCrory added over $700 million in new funding for transportation over two years and ended the annual transfer of $216 million from the Highway Fund to the General Fund. An interchange on U.S. 158 and traffic circle on N.C. 12 are also included in the project. “The primary purpose of the reforms was to ensure transportation funds were being spent on transportation projects and not diverted to other state programs,” McCrory said. Over 10 years, the budget reforms are projected to provide an additional $1.6 billion for N.C. Department of Transportation construction projects, the governor’s office said. Other projects in the state that are being accelerated by the changes include the final leg of the eastern section of the Winston-Salem Northern Beltway, the Asheville Connector, and the Weddington Road/I-485 interchange in Charlotte. The complete list of accelerated schedules for transportation projects will be presented to the Board of Transportation for their review at their December meeting, with their approval expected in January 2016. “These budget reforms, coupled with our 25-Year Vision and the new transportation funding formula that emphasizes congestion relief, safety and job-creation will make North Carolina more competitive and prepared for future economic growth,” McCrory said. 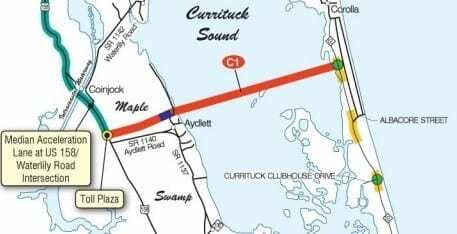 Within the layout of the Strategic Transportation Improvement Plan, the Mid-Currituck Bridge was ranked low as a regional and statewide priority, but was included on the list of future projects that was finalized last June.